Need clean eating breakfast idea? These skinny Carrot Cake Oatmeal Cookies are easy, yummy and healthy recipe, you must try it. If you want to start a clean eating these cookies are perfect for beginners. The recipe is super simple and the cookies taste great. Carrot Cake Oatmeal Cookies are soft and tender. They are like classic carrot cake transformed into easy and healthy cookies. 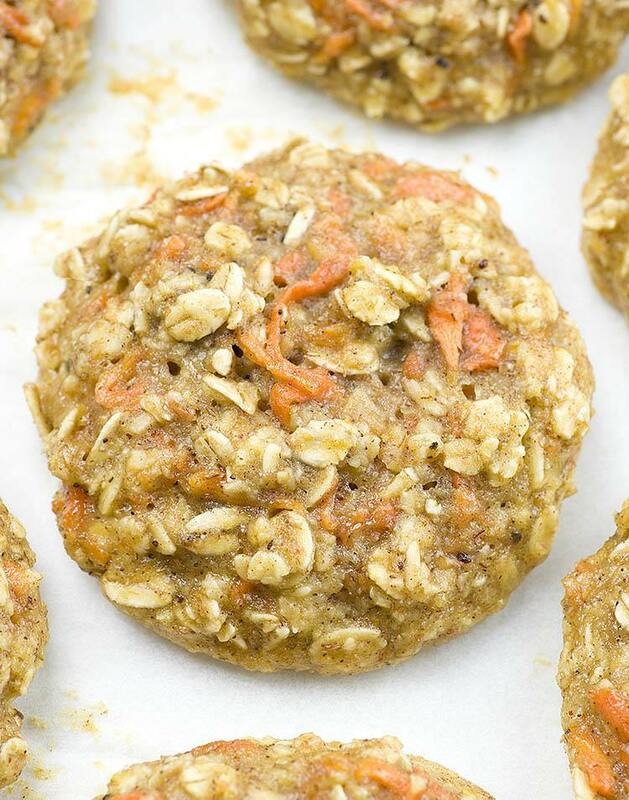 In order to make clean eating breakfast cookies, these simple recipe use only healthy ingredients: oatmeal, whole wheat flour, carrots and honey. Needless to say that whole wheat flour is much healthier than regular white flour. Also using honey as a natural sweetener is way much better than refined white sugar. Carrot Cake Oatmeal Cookies are such a fun way to eat grains for breakfast. Besides grain, these cookies are loaded with carrots. This way you can trick your kids into eating some veggies, too. Kids won’t skip cookies, right?! 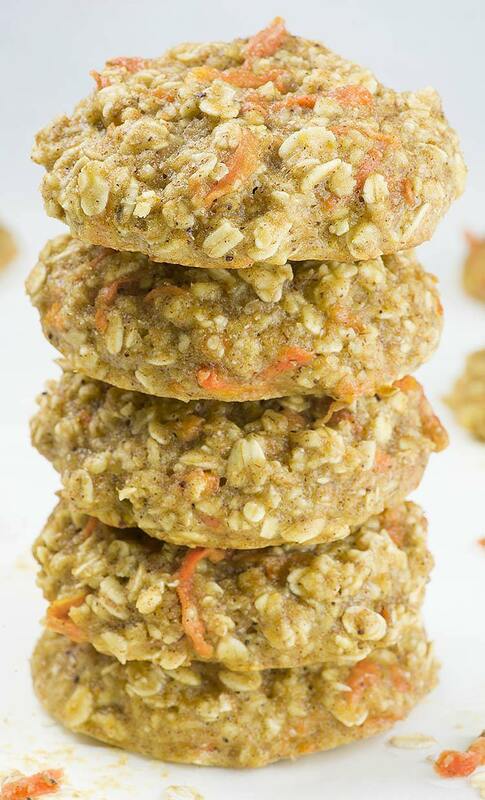 Therefore if you need clean eating breakfast or healthy snack for your kids, try these easy Carrot Cake Oatmeal Cookies. Kids will love them. Also if you want healthy breakfast for yourself these cookies are very good choice. The recipe is very quick, simple and easy. These oatmeal cookies are great if you need make ahead breakfast. You can pack a few of these clean eating breakfast cookies and eat them on the go. You don’t have to eat these cookies just as a breakfast or healthy snack, they are amazing as a dessert, too. But it’s healthy dessert, which is a win-win situation!!! After all these Carrot Cake Oatmeal Cookies are so tasty, you could never tell they’re healthy. Speaking about healthy, clean eating, easy breakfast recipes, make sure to check these Skinny Chocolate Chip Banana Muffins. These healthy muffins are freezer friendly. It’s perfect for your meal plan, especially if you prefer make ahead recipes for your busy mornings. These skinny Carrot Cake Oatmeal Cookies are easy, yummy and healthy recipe, you must try it! Whisk together instant oats, flour, baking powder, cinnamon, and salt, set aside. In a large bowl whisk together egg, vanilla and coconut oil. Add honey and stir to combine. Stir in dry ingredients mixture, then fold in carrots. Cover the dough with plastic wrap and chill for 1 hour. CHILLING IS MANDATORY!!! The oats need some time to soak some moisture, also prevent cookies from flatten completely. Preheat the oven to 350 F, line large baking sheet with parchment paper and set aside. Using ice cream scoop drop the ball of cookie dough onto baking sheet leaving two inch space apart. If you chill the dough longer and the dough is very thick flatten the cookies slightly before baking. Bake for 11-13 minutes. Cool the cookies on a baking sheet for 15 minutes ( they need to finish cooking on warm baking sheet) then transfer to a rack. Could I substitute almond flour instead of ww flour? Hi Christine, I think you could try it. Hi and thanks for the recipe. Does ‘skinny’ mean low calorie? How many per cookie? Can you substitue something for the coconut oil? 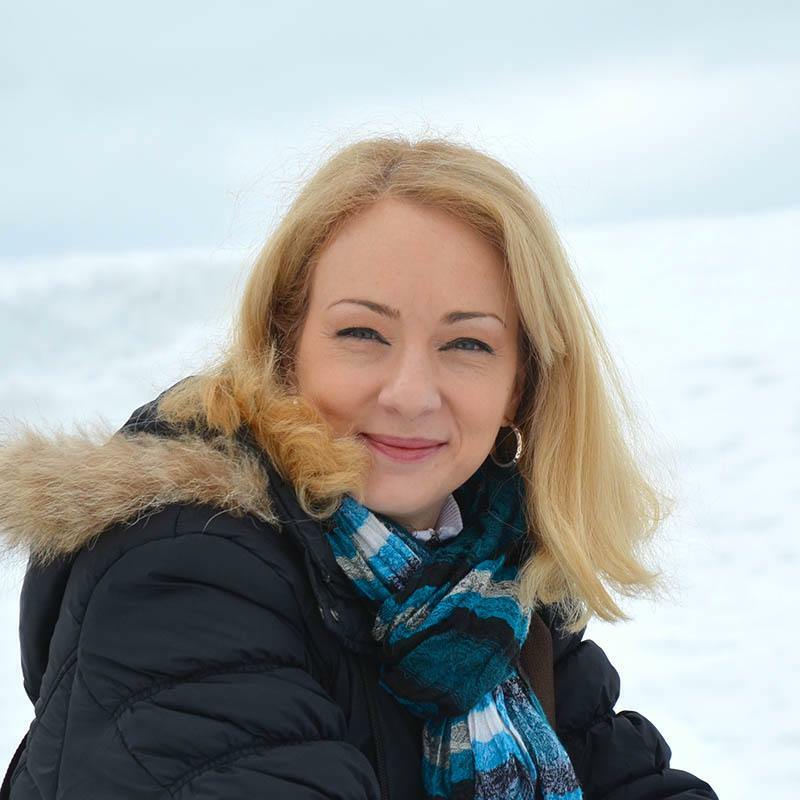 Hi Annette, you can use melted butter. Hi! I’m excited to try this recipe! How many cookies do you get from one batch? Hi there! Flavor was great, but the cookies fell apart. Followed everything , except for submitting wheat flour with coconut flour. Could that be the problem? What could you substitute for the egg if you cannot have egg yolk? Just use the egg white?